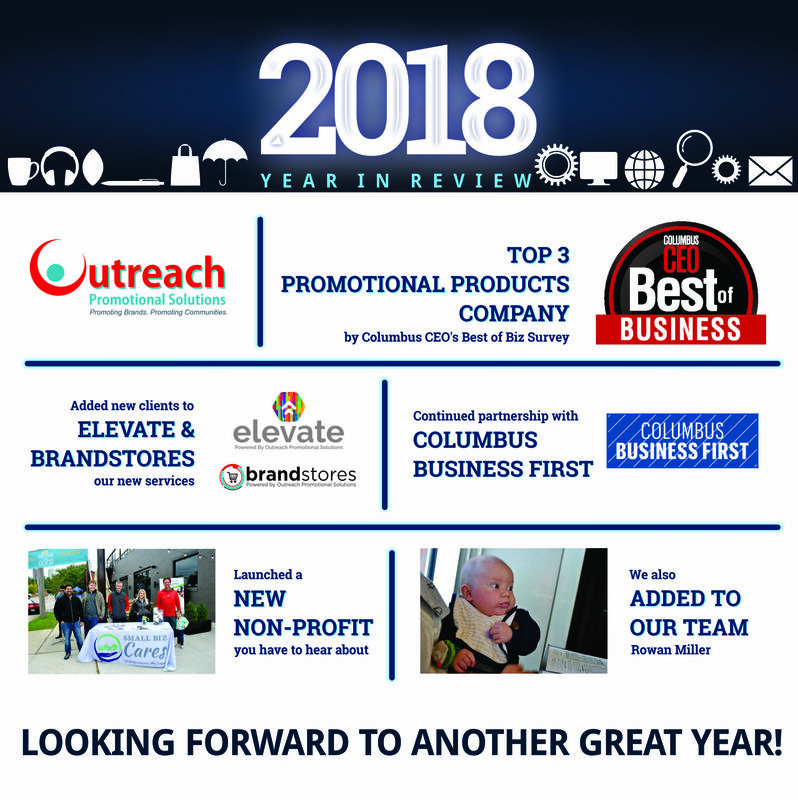 In our 2018 mid-year review, we thought it’d be valuable for us to look back on the accomplishments and milestones we’ve reached so far. Outreach Promotional Solutions has had the privilege of working with some of the best and brightest companies nationwide. 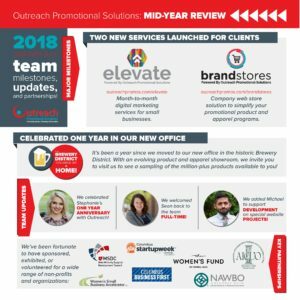 Thanks to our clients, partners, and staff, we’ve grown from a one-man operation in 2012 to a spunky little marketing agency with more capabilities than ever before. We launched two new services earlier this year. Elevate is tailored to small businesses in need of data-driven digital marketing. 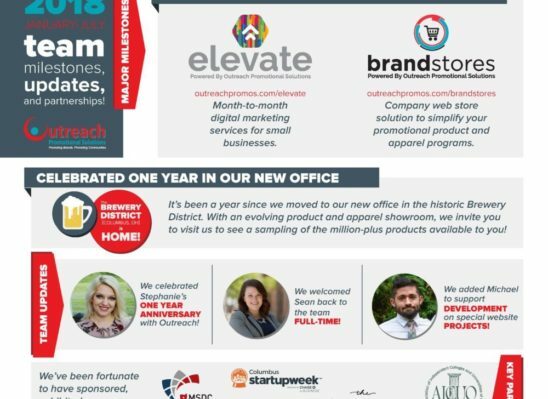 Whether it’s a lack of know-how or a lack of time and resources, the Elevate service steps in and becomes the client’s digital marketing department. Brandstores is our company web store solution. Want to see how renowned brands like BORROR use Brandstores to manage their promotional product and apparel programs? 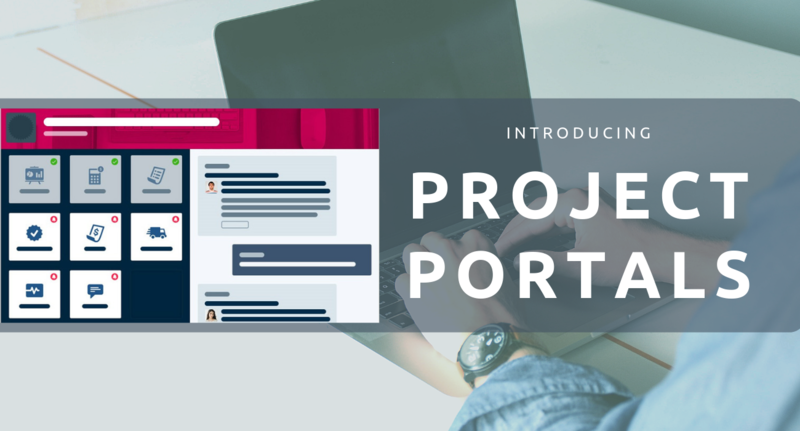 Check out this blog post and share with your team! The Outreach team also celebrated one year in our new Brewery District HQ! Even our showcase room is coming along nicely. We invite you to stop in to see what’s new in the promotional products world and meet the team behind it all. We welcome dogs…and horses. Lastly, we can’t forget the partnerships we’ve developed so far this year. A major part of Outreach Promotional Solutions is our commitment to non-profits and volunteering – and we plan to keep it that way. See below a partial listing of the organizations we’ve either sponsored or volunteered for in 2018. It’s always good to look back to see how far you’ve come – and to prepare yourself for the what’s to come. Thanks for joining us on this journey.